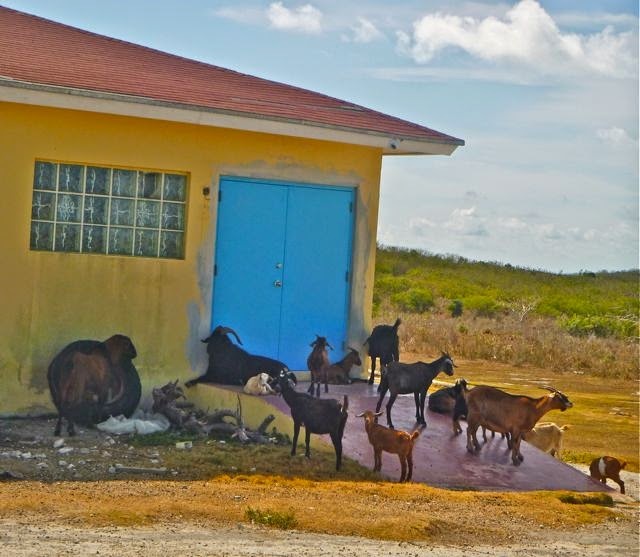 Goats; made in the shade of tHatchet Bay Eleuthera Bahama's BTC building. "There's an experimental farm up there.... Organics.... Sounds interesting to me, but if you're no up for it, that's okay," temporized Andy. Little did he know, we're fans of that closed system farming style, expounded by investigative writer Michael Pollan, probably best known for his book "The Omnivore's Dilemma." It was the start of our second Eleuthera daylong road trip. Andy and Ann once again were our companionable partners in crime, if rental car abuse is a crime. "Sure. Why not?" Wayne replied. If not for Andy. we would've bypassed Cape Eleuthera Institute (watch for more on that in a future post; meanwhile click here for their website) on our prior communal road trip. That, coupled with checking out the institutes's recommended treat (watch for more on that in a future post, too) were the highlights of that day. "Turn here!" Andy directed; Wayne cornered quickly. The farm was a bust. Twas long enough abandoned that even the scant remaining debris was uninteresting; though I'm one of those odd ducks who often finds decay more intriguing than modernity. Pretty sure that seated black billy ruled these roustabouts. But wait! The road less traveled paid off in an amusingly odd juxtaposition, we'd never otherwise seen. 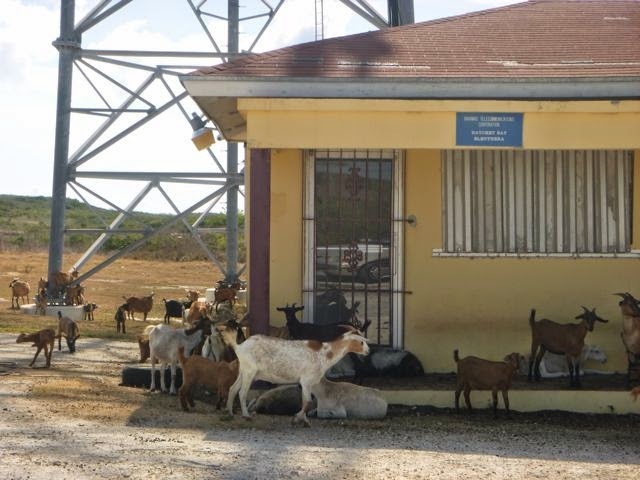 Surrounding (and I do mean surrounding) the nearest Bahamas Telecommunications Company (BTC) facility -- provider of our ocean-accessible $30/2.5 GB Internet connection/hotspot -- goats! LOTS of goats. Gaggles (doesn't that sound better than "herds"?) 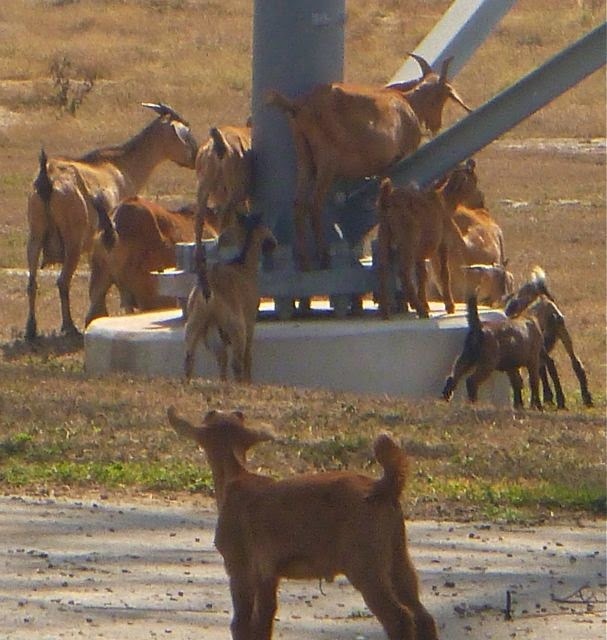 of goats -- billy goats, mama goats, baby goats, randy goats, sleepy goats, rambunctious goats.... sleeping in the shade of the BTC building's porch, tucking, catlike, underneath the BTC truck, clambering up the BTC phone tower. Sorry, AT&T. BTC's more my idea of mobilizing the world. Goats. 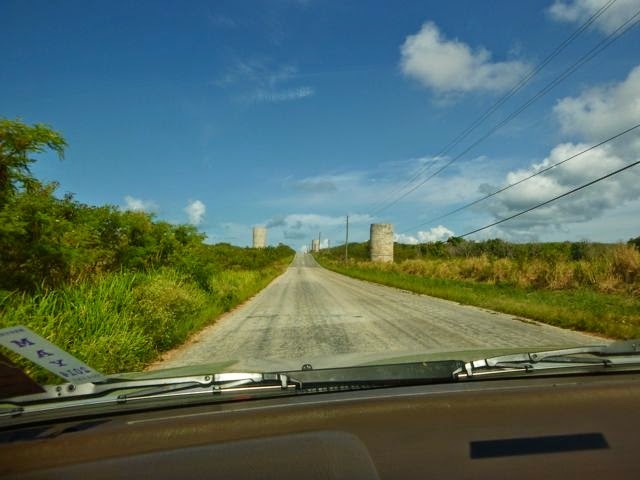 Road between Eleuthera's Hatchet Bay Caves and local BTC office. BAHAMAS retrospective. 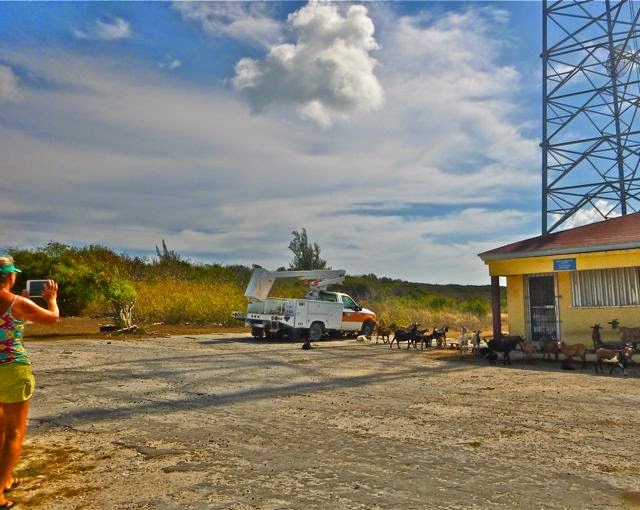 This blog post is a recent retrospective of our road trip out of Hatchet Bay, Eleuthera, BAHAMAS (N25.20.962 W76.47.384) April 28, 2014. Now that my cruising season photos are finally re-accessible (yay! 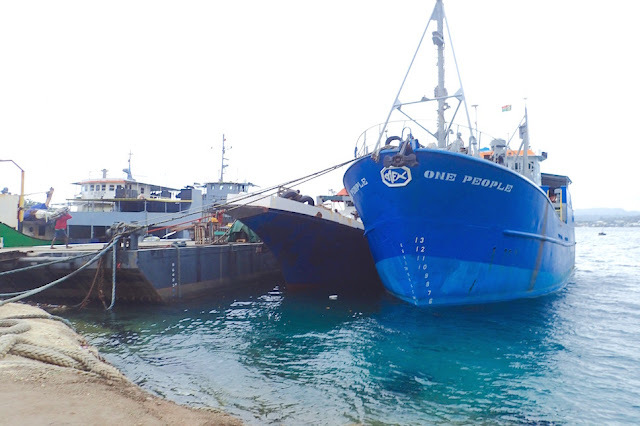 ), watch for more BAHAMAS retrospectives; though my broken right wrist is slowing down my posting catch-up. We are currently working over hurricane season in Jacksonville FL; this time with our boat “on the hard” in Green Cove Springs, until just before we leave in November, bound for the South Pacific via the Panama Canal. Nice sharing friend! your blog is very interesting and informative. It will be very helpful for me. Last year my uncle choose the tour new year to celebrate the New Year. I'm tourist and like to go in different places around the world. I'm never going in this places that you shared in this blog. After reading this I want to go there as soon as possible. Good Job and keep sharing. 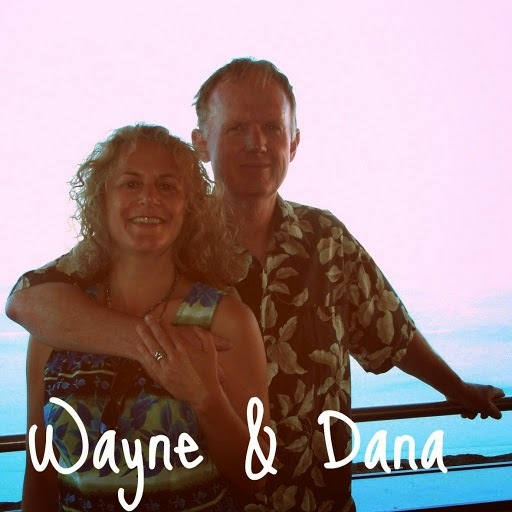 Jani Jack you have a very interesting collection of travel blogs. It may be hard for you to choose where to go!